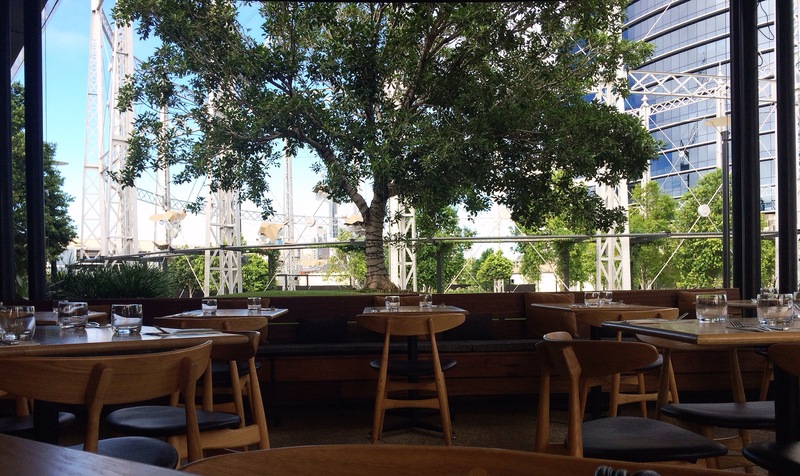 A pleasant atmosphere, with an upmarket, yet relaxed feel, enhanced by a view across to the old gasworks structure. Hatch & Co sits on the corner of the Gasworks Shopping complex. A large sprawling open plan restaurant. 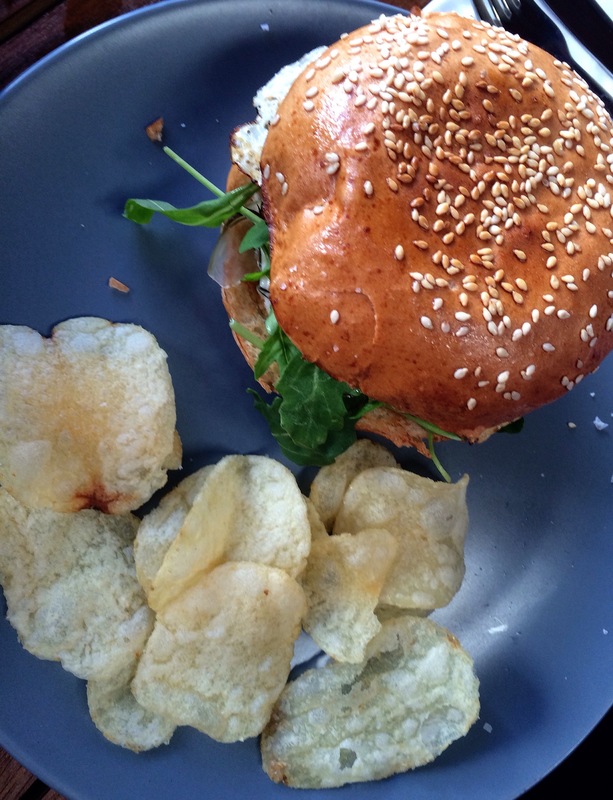 Breakfast is served on the weekends in addition to lunch and dinner. Politely greeted and seated by one of the waitstaff, we were offered a choice of water, and given menus to peruse. Our chosen water arrived quickly, prior to our drinks order being taken. We were very impressed at the extra effort this staff member went to, after I enquired about a herbal tea. As the menu didn’t state the varieties, he disappeared with the drinks order, arriving back at the table shortly after,with a list of the tea selection he had written into his notebook. I think he was rather relieved we appreciated his effort! 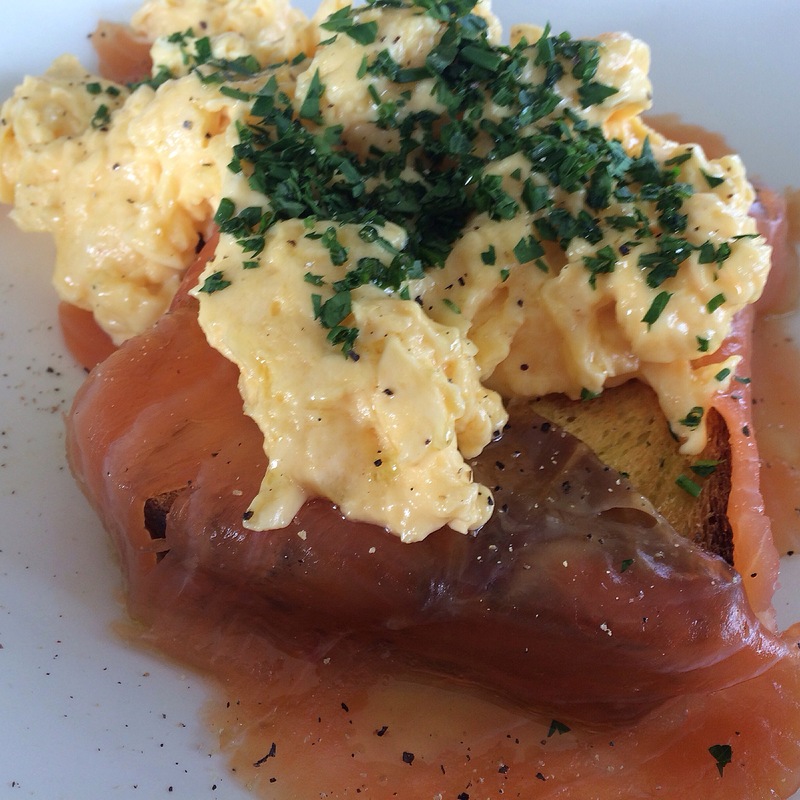 My choice for breakfast was the house cured salmon, scrambled eggs and chives, resting on a toasted brioche. A beautiful, nicely presented meal, with the light, fluffy scrambled eggs mixing well with the tasty salmon and a delightful flavoursome, brioche. 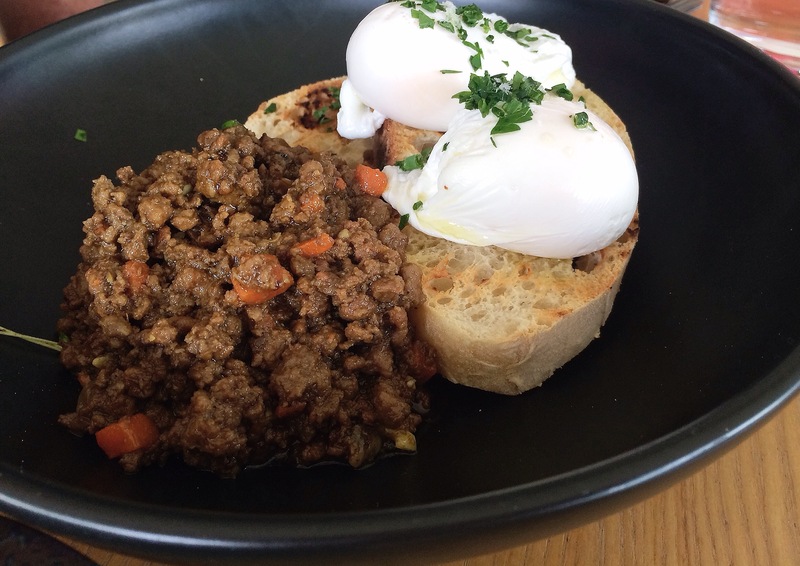 Hubby’s choice, was the poached eggs with a side of savoury mince. They were delivered with the mince in a side dish. The meal, I’m told, was a fantastic combination choice, all tasty and enjoyable. Savoury mince is one of Hubby’s favourites, meaning he is always delighted to find this on a menu. 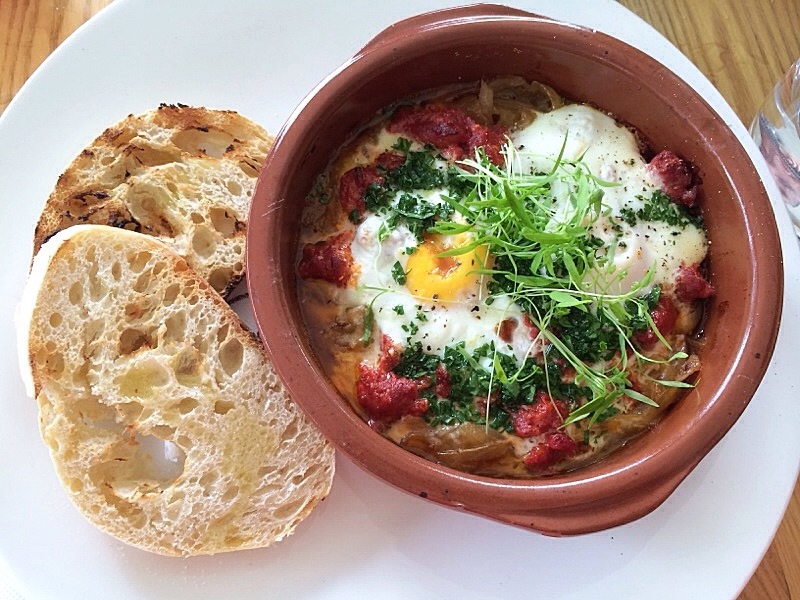 Another meal choice was baked eggs,chorizo, gremolta and grilled sourdough. A definite winner too! Chocolate, by the Bald Man. Chocolate everything, even pizza. Probably not the place to go if you don’t eat chocolate. Although, should you enjoy partaking in the odd chocolate overindulgence ……. 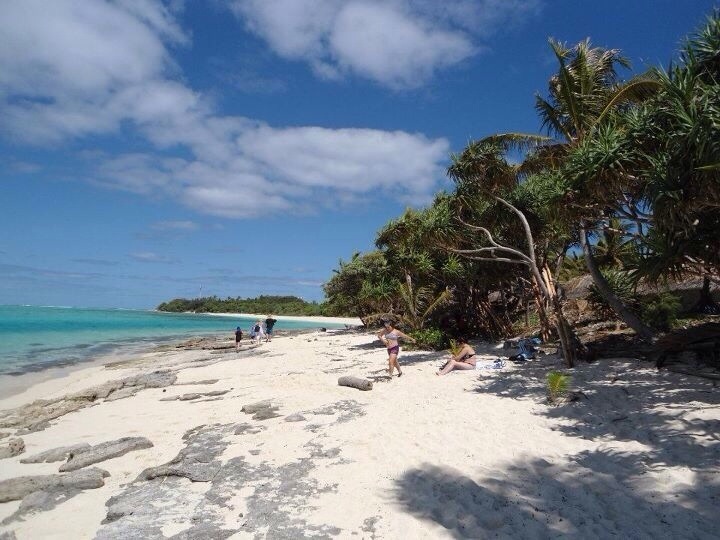 …..Then this is the place to go. 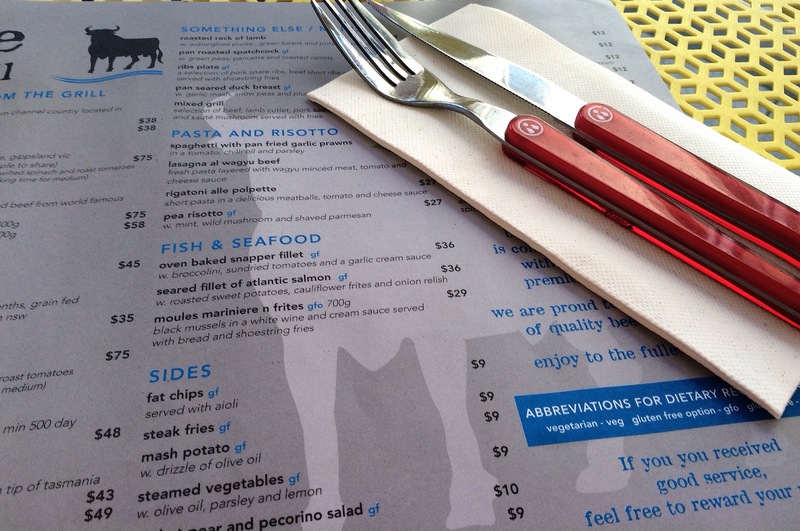 Your menu choices are seemingly endless. Pictured above is the Praline Meringue Puff Extravaganza, filled with vanilla ice cream, topped with caramelised pecans and strawberries. Very decadent, highly un-necessary, yet it is a must try for those who enjoy pavlova and chocolate. I could not follow this through with a chocolate milkshake, choctail or icy shake. Luckily for me, there was a refreshing herbal tea menu available. 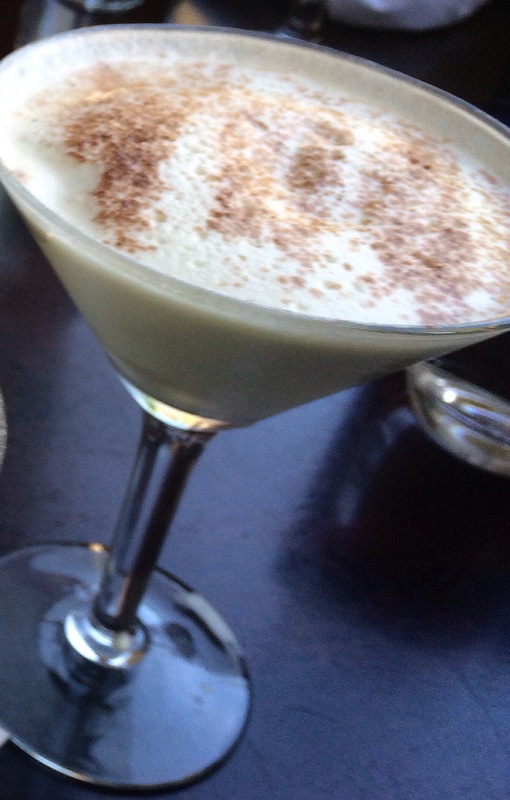 From this, I chose and enjoyed, the perfect accompaniment to my indulgent dessert. The tea certainly helped to wash the dessert down. This praline, was as good as it looked. Perhaps lacking a few dollops of cream to finish, otherwise, a most enjoyable, struggle to the finish line, treat. Hubby’s choice was the I-Scream-Max-Wich. 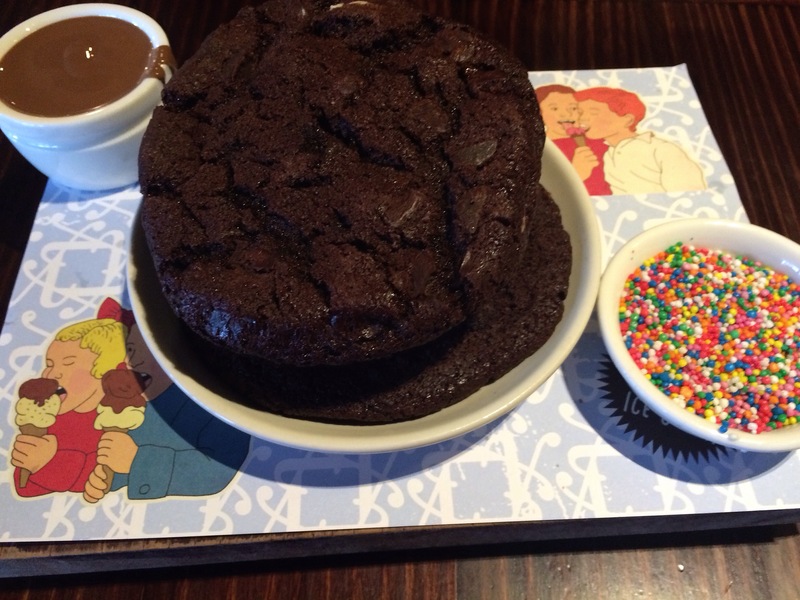 Two OMG double choc cookies, sandwiched together with vanilla ice cream and accompanied by a pot of melted chocolate as well as a pot of sprinkles, allowing you creatively finish your dessert design. Very rich, as well as being on the top end of the overindulgent scale, this dessert wasn’t finished……although that was not due to the lack of trying on hubby’s behalf! Plenty of seating within the restaurant, tantalising treats on display, a menu which reads like a novel, finished with a shop area, giving you the opportunity to purchase and take home a little extra decadence. Pretty much all you need for that special occasional treat. 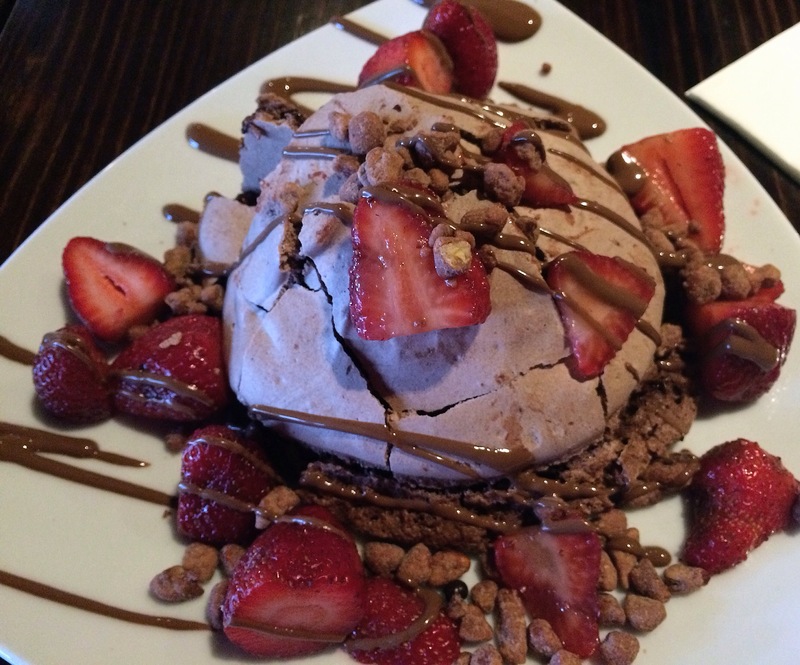 Treat yourself sometime, just go easy on the chocolate overload! Unassuming from the road, this industrial style cafe is located on the outer fringe of central Brisbane, in the suburb of Newstead. Near the kitchen area, there are some clever uses of old coppers, now masquerading as light shades. 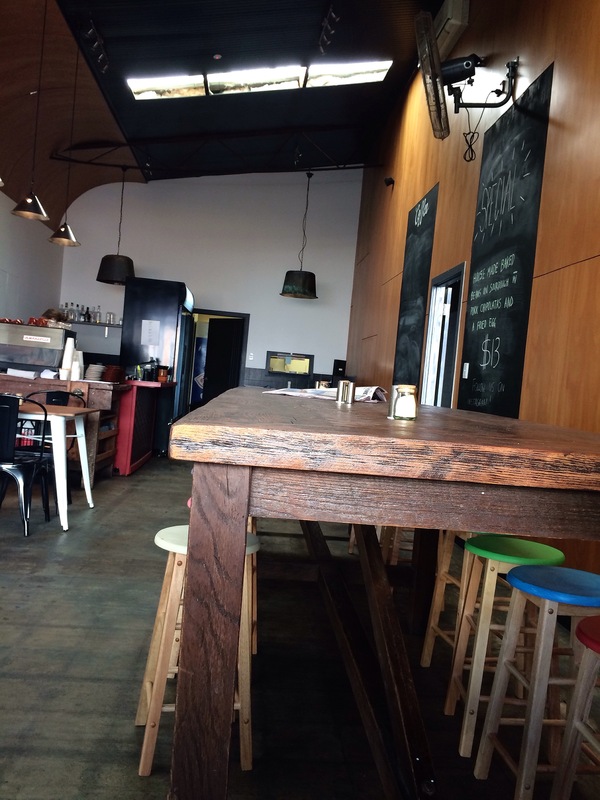 A huge oak, bar height table, is surrounded by coloured stools, inviting you to take a seat. Alternatively you have the choice of one of the table settings in the cafe. The simple single paper sheet menus for the food and drinks, fit the basic industrial style of this cafe. 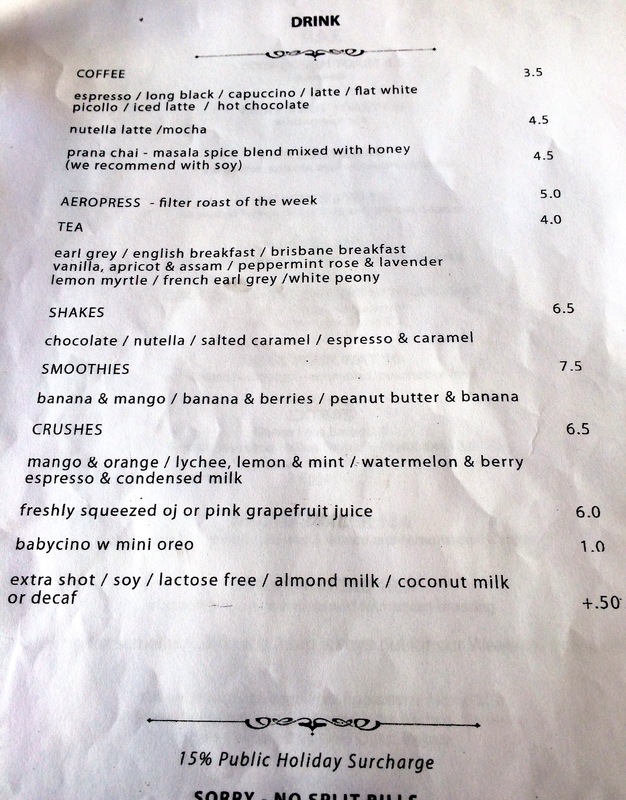 Both menus for breakfast included some interesting items, however the drinks menu definitely won over with the creative combinations available. Espresso and condensed milk crush or peanut butter/banana smoothie. Perhaps you would prefer a Nutella latte or espresso with caramel shake. An interesting variety of teas and coffees are also available. 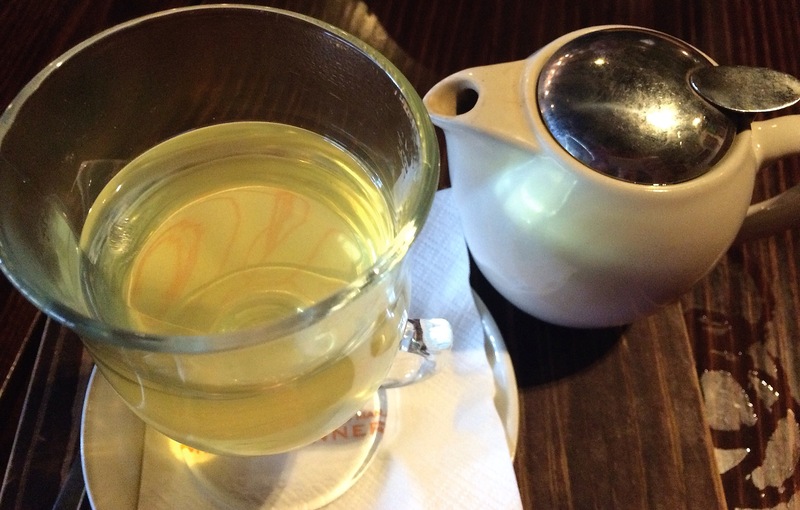 I did enjoy the lemon myrtle tea, an uplifting tea making a refreshing change to my usual green tea choice. 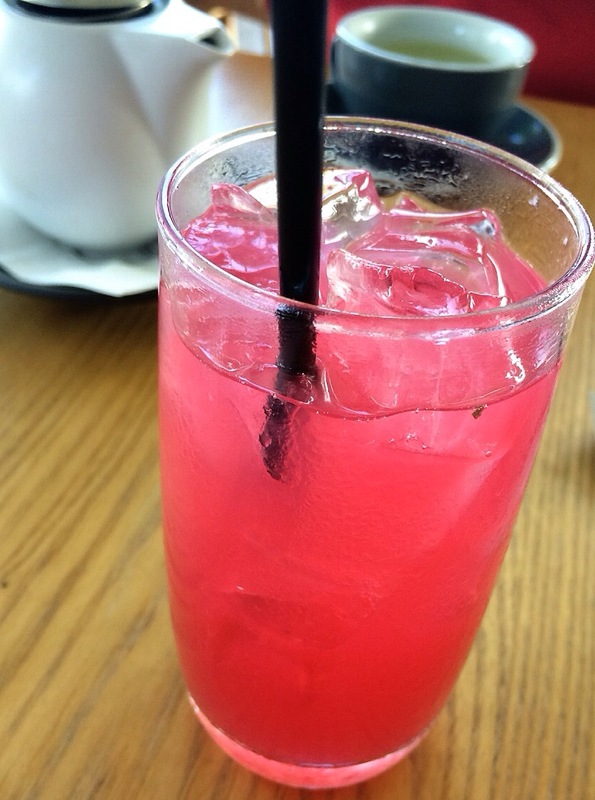 I savoured the watermelon berry crush too, with the watermelon gently neutralising what could have been a sharp berry taste. Other drinks enjoyed at our table, included the peanut butter/banana shake, lychee/mint/lemon crush, espresso/condensed milk crush, and Nutella latte. All were pronounced delicious. The only small problem was the size of the handle on the cappuccino cup, not being big enough to put the fingers through. Certainly this in no way affected the taste, which was of a very high standard! Meals arrived to the table, accompanied by the clearing of empty drink receptacles. All of the meals were nicely presented, tasty and well enjoyed by all. To be fair, this cafe was not our original destination, however, luckily I’m guessing, the place we did pick had 7am advertised as opening in their website, but did not open until 8. 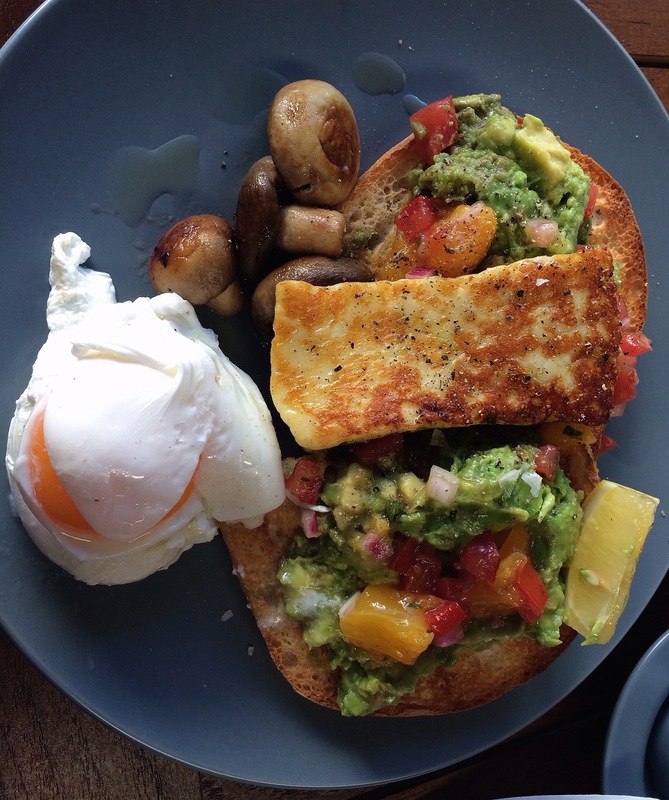 A quick google for a breakfast venue in a nearby area was what brought us to Shucked. Perhaps a timely reminder to check websites are updated with correct opening times and general information. The result though, was an enjoyable breakfast, with friendly helpful service, at Shucked Cafe. Certainly well worth the visit! Seeking an venue, for some time out from the world, whilst enjoying a long lingering lunch, we chose Belvedere at Portside. A beautiful sunny afternoon, we missed the lunch rush, which meant we could wile away some time watching the cruise ship depart Portside. A very relaxing way to wind up another busy week. The menu included plenty of variety, including many dishes for two. which made for a difficult final decision. 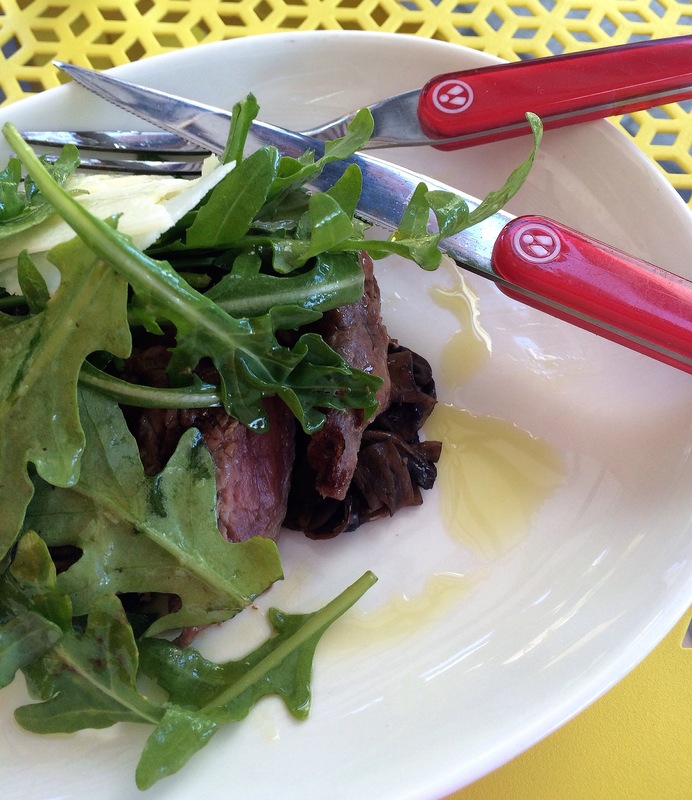 I chose the entree of rare seared beef, braised mushrooms, parmesan and truffle oil, partnered with a rocket pear and pecorino salad. Hubby choice was a mixed grill which included pork cutlets, pork sausages beef, and bacon. These meals were superb. Meat melted in the mouth, everything was fresh, with just the right amount of flavouring. Very impressive. Certainly no complaints with the service here, professional, yet still service with a smile. 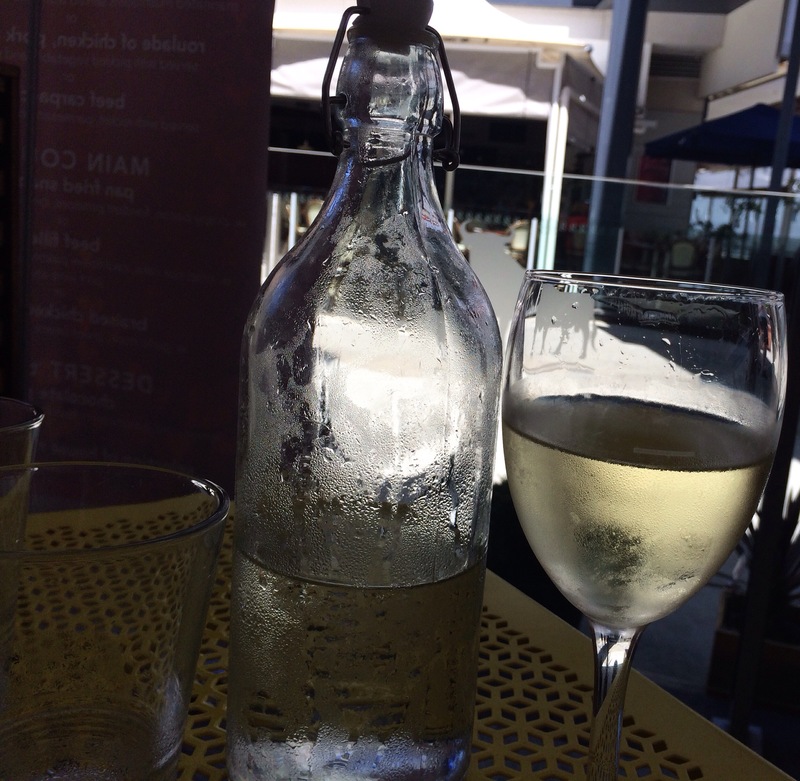 Chilled water was delivered to the table along with the arrival of the first friendly waiter. We did have a few different staff visit the table, which, in a way added to the relaxing afternoon and a bit of variety. This restaurant set up with a bar area including a bar menu, which should appeal to most budgets. I could see this being a very tempting place to wile away an afternoon or evening. In particular, if you like to see what’s happening in the world, there’s always something to see here. This is one of the variety of eateries in the Portside area, however it certainly is one worth a visit. 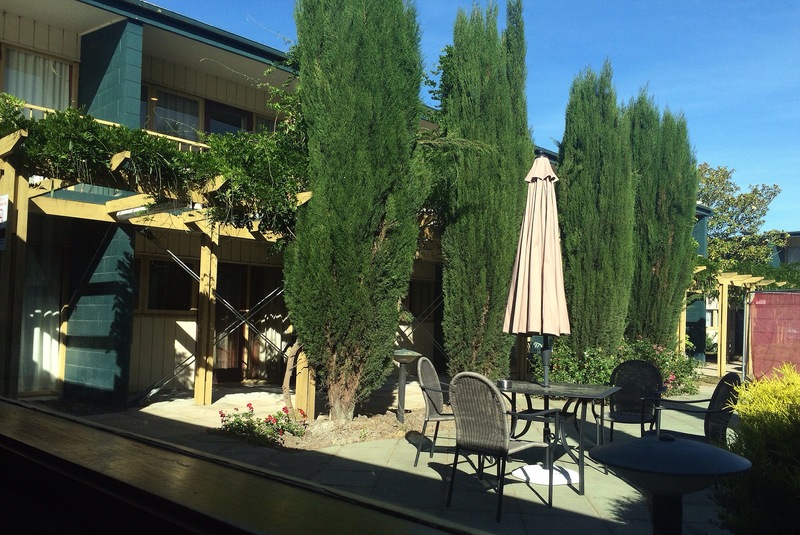 Located alongside Christchurch Airport, you will find the Sudima Hotel. We used this hotel at both the beginning and the end of our Lower South Island road trip. There is a free shuttle service running from the hotel to the airport constantly. A large sprawling older hotel, with one level above ground floor, the long, seemingly endless corridors, are reminiscent of school hallway days. At the moment the hotel is undergoing renovations, with a lot of construction happening. The plans displayed in the foyer, keep you up to date with the big changes ahead. Surprisingly though, given the close airport location, rooms here were very quiet, obviously well insulated from the airport noise. Everything was clean, tidy and well presented, from reception, through to the rooms and the restaurant. Courtyards are visible in the middle of the hotel area. This one was our view as we dined in the restaurant on our last night. We chose a premium Bureau room, which includes air conditioning, unlike the standard room. Our rooms on both stays, were located on the second level, the only thing I missed from these rooms, was a balcony. However as both our stops were short overnight stays either transferring to or from the airport, it didn’t matter. Some of the rooms did have balconies, so my guess would be to request a room with one if you prefer a balcony. Buffet breakfast after our first nights stay was fresh with a good selection of the normal buffet breakfast foods. Well enjoyed after our midnight arrival, followed by a well deserved rest. Upon reaching the end of our trip, we arrived in time to enjoy dinner in the Lobby restaurant. If we hadn’t been as tired, we would have quite enjoyed a relaxing drink in the bar area. However, on this occasion, by the time we finished savouring our dinner, the exhaustion was setting in. 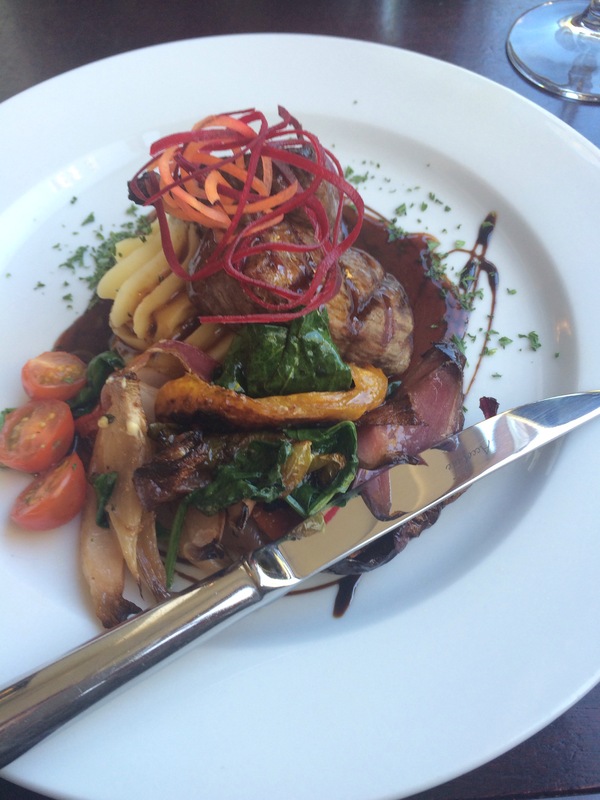 My choice of the venison dish, perched on a shell shaped bed of mashed potatoes, was an absolute delight. Not only very well presented, the meal was cooked to perfection. This was melt in the mouth venison, a devine dish. We definitely had no problem with the food quality here. Sometimes you feel the need to finish with something a little sweet. 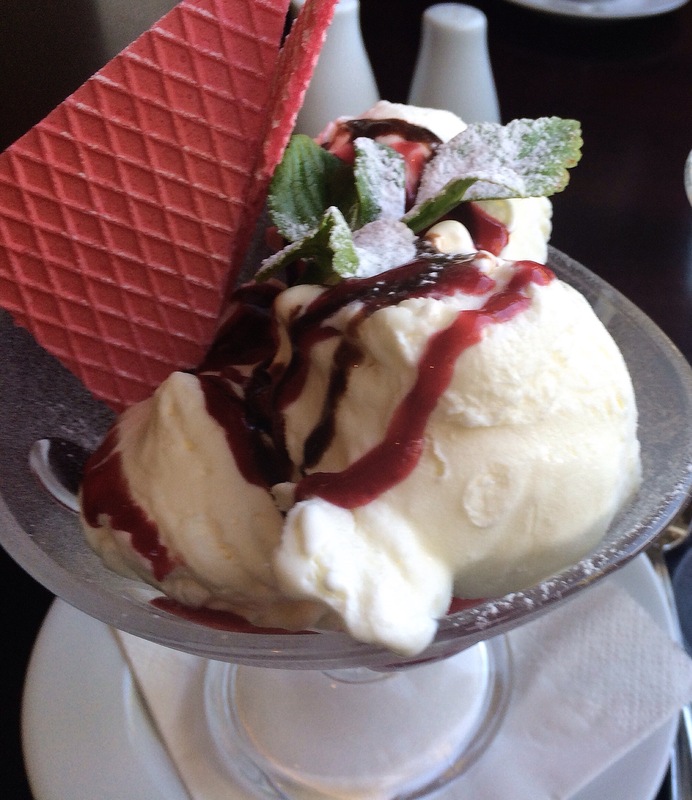 This was the case this evening, however we both only wanted something light so our choice of a basic ice cream sundae, satisfied the sweet tooth nicely. Staff here were all polite, helpful and professional. We enjoyed a bit of light banter with our waiter, as we were the first to arrive in the dining room that evening. If you’re looking for somewhere to stay to ensure you don’t miss your early flight, then I do recommend the Sudima. Another bonus I was advised of upon checkout, they can now link the value of your stays to your Air New Zealand loyalty card, which will help to boost your points. I’m not sure if this also applies to Air NZ’s partner airlines. Might be worth checking out though. Enjoy your stay. 👍. You may even take the time to indulge in a refreshing cocktail!